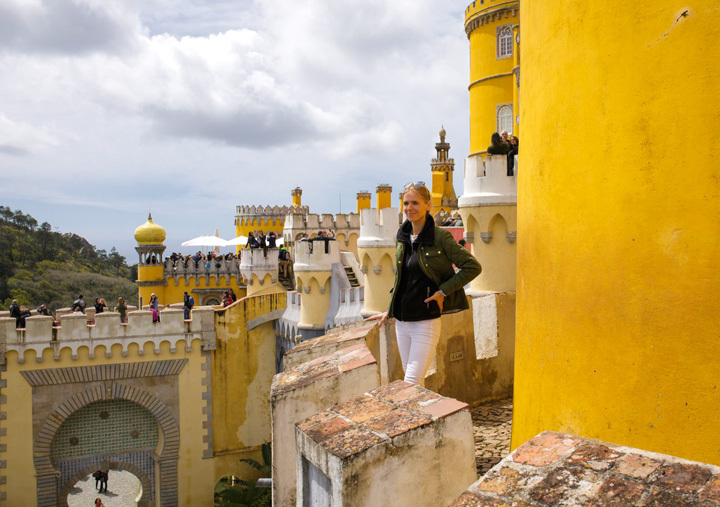 Portugal is simply a marvel among countries, and I am going to share my eccentric experience and all the adventures I encountered there to inspire you to visit this stunning place. But first of all, I will like to congratulate all those who had made the decision to pay Portugal a visit; you’ve made such a wonderful decision and it promises to be a terrific experience all the way. Watch a short film and read the blog. For a fantastic family trip destination, we chose Portugal and equally recommend same to you. For so many great reasons; its hospitable people, the charm of her grand architectural edifice, how close the country brings you to nature with her evergreen grasslands and lots of other natural dazzles plus, its second to none culinary services. With a size of about 4 times smaller than California, it’s really amazing to discover how much lures and attractions are compressed into this small beautiful piece of earth. It will take at least 7 to 10 days to see and explore most of its wonders. We had decided to travel in the first week of April, but soon than later we had realized we weren’t so lucky with the weather. With a temperature of about 50-60⁰F, it rained just about every second day. But fortunately enough, the rains did not disturb our exploration and we got the most out of our 10 days in Portugal. 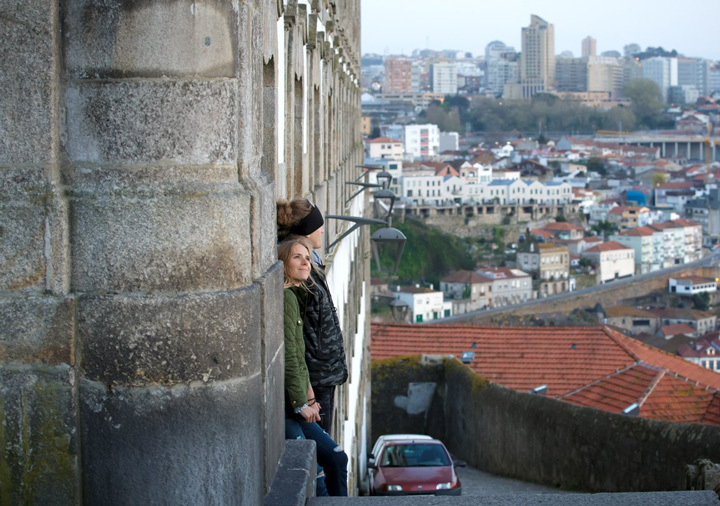 The adventure started in Porto which buzzes with life, romance, beauty, and magnificence with dazzling architecture. A walk through the narrow streets where the peaceful locals live and play, watching them spread their clothes outside to dry, and seeing the children playing and running adds a touch of uniqueness to everything. 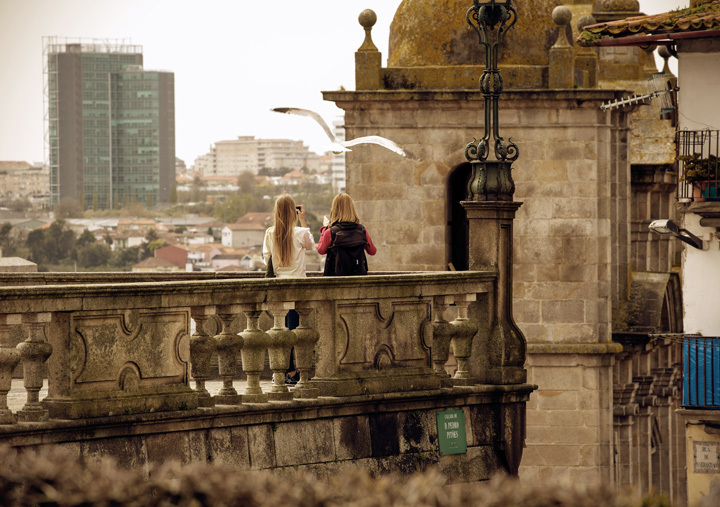 Major attractions and lures are within walking distance from the cities, like the train station of The São Bento Railway Station, Clérigos Tower for a panoramic view of the city, Porto Cathedral, Church of São Francisco, and the palatial former 19th-century stock market- Palácio da Bolsa which is renowned for its exquisite façade and ornate gilded Arabian Hall in Porto. 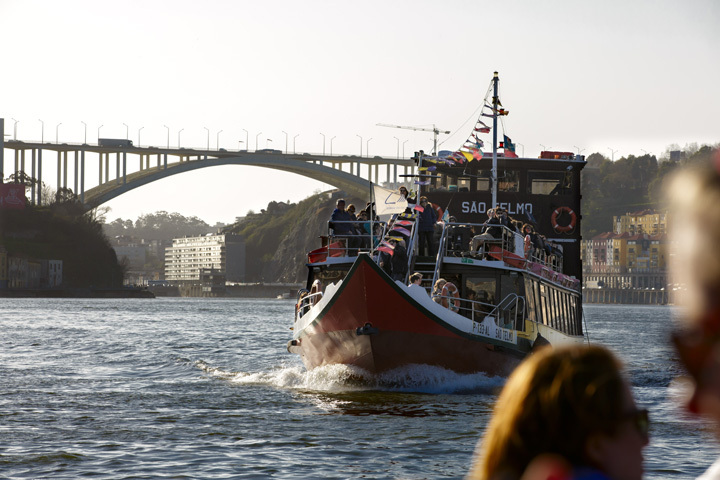 While at Porto, take six bridge riverboat cruise in the Douro River on one of the old boats which used to carry Porto’s cargoes, called “Barco Rabelo”, boat tour takes about one hour. 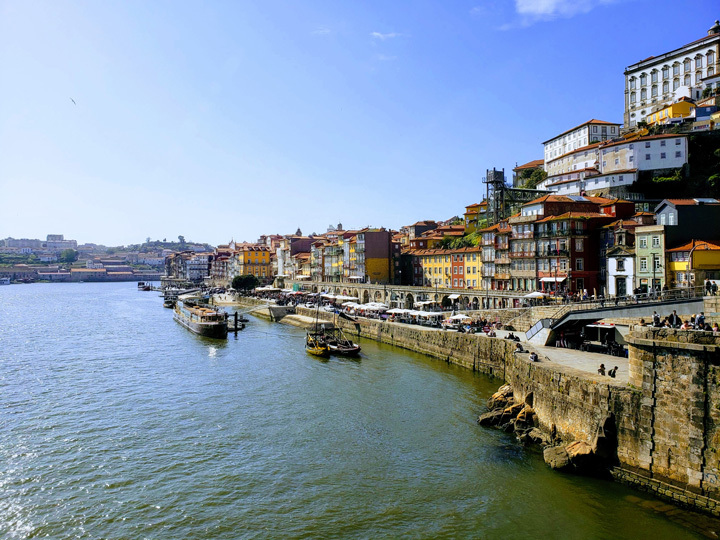 By being on the opposite side of Douro River, you can enjoy the best views of Porto’s old city with restaurants and cafes and do a wine tasting tour in one of the wine cellars over there. I strongly recommend you make a reservation for a wine tasting tour in advance in the finest and oldest winery called Calem. 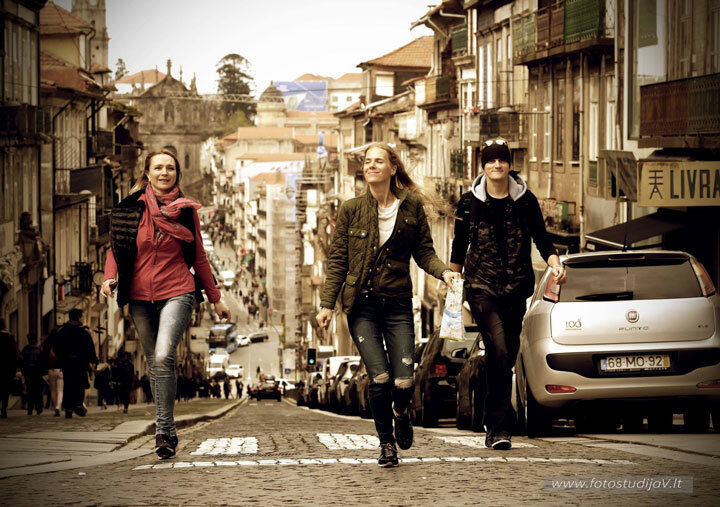 The main shopping district in Porto is street called Rua de Santa Catarina. On the same street there is the famous Majestic cafe –Belle Epoque-era cafe with ornate interior featuring carved wood, mirrors & chandeliers, designed and built in a different style than other buildings. 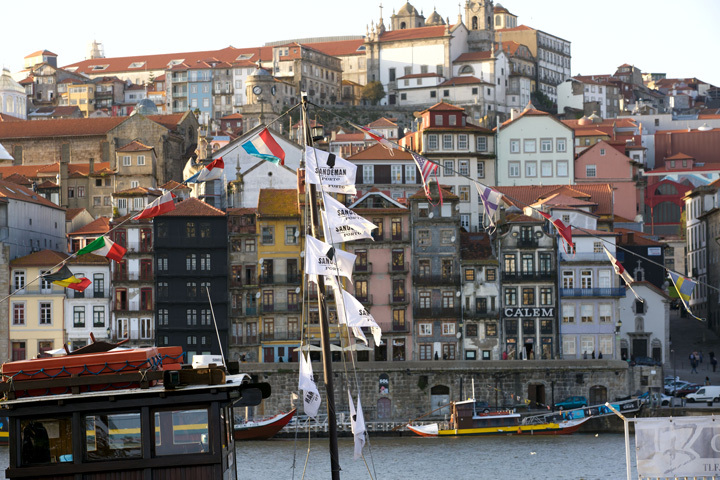 Extremely beautiful and charming, it is one of the most beautiful cafes in all of Porto. Bell Epoque-era café used to be a special café for only the elites, and although it is still not a place where locals go, it has become more of a touristic place nowadays. Pricing is high and the coffee is good, but not as great as some other places which even charge lesser (when you’re comparing coffee price with other places espresso is for 0.70 euro cents). The interiors are however, quite stunning. You might want to go in with your camera handy to immortalize this moment and capture the raw beauty of the interior designs. For great coffee with a delectable breakfast, I would really suggest Café Progresso. They serve one of the finest coffees and my dad got his best omelette ever there (they even roast their beans themselves). Café Progresso was recommended to us by a local, and that’s about the best way to get great recommendations. Lunch or dinner, I would highly recommend you check out Tapabento. They seem to be very popular; so it’s wise to make a reservation for dinner. 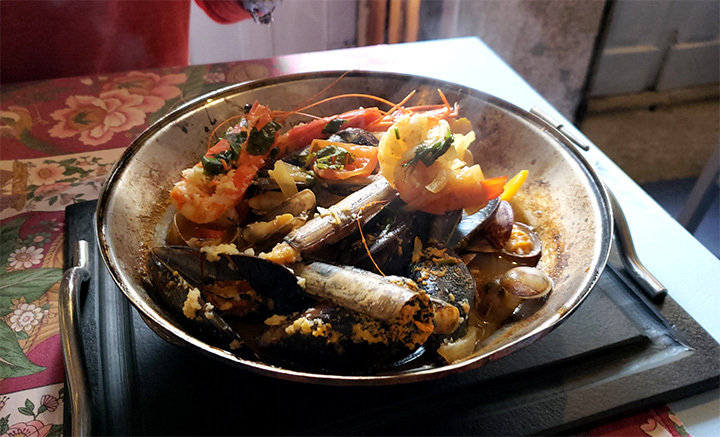 Nice, authentic atmosphere, great staff and of course scrumptious food; the seafood mix is top notch! 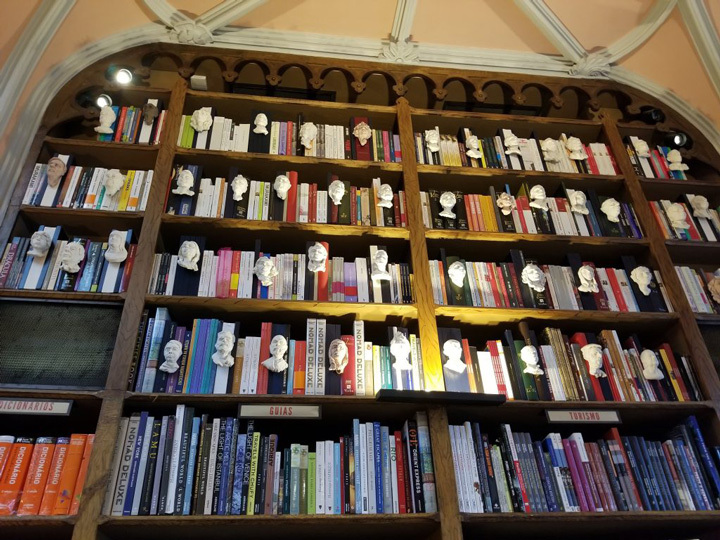 You probably heard about Livraria Lello – one of the oldest bookstores in Portugal. It’s a fabulous bookshop with a totally unique spectacle of an amazing interior architecture that inspired the Harry Potter’s library. For libraries expect long lines and don’t forget to buy your tickets around the corner, they don’t sell the tickets inside the library. Porto currently has three regular tram routes. 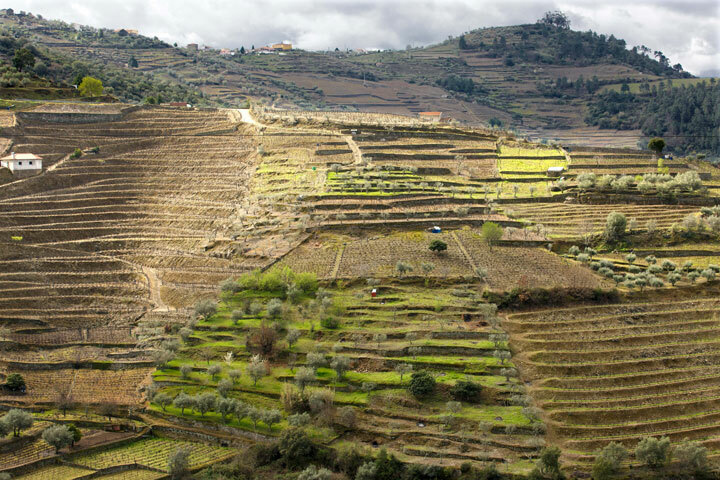 We chose Riverside line, the route between the historic centre of Porto and the garden of Passeio Alegre on a single path along the banks of the River Douro. It is nice if you have not had a boat tour in Douro River before because you get see just about the same view. The view gets even better in summer. 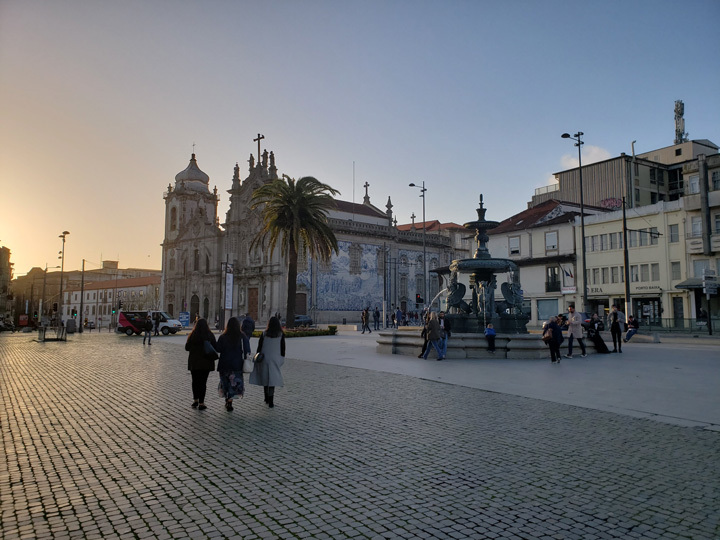 It’s best to take a different route for the tram, probably, the one which traverses the emblematic streets of the city centre of Porto in a circular route. 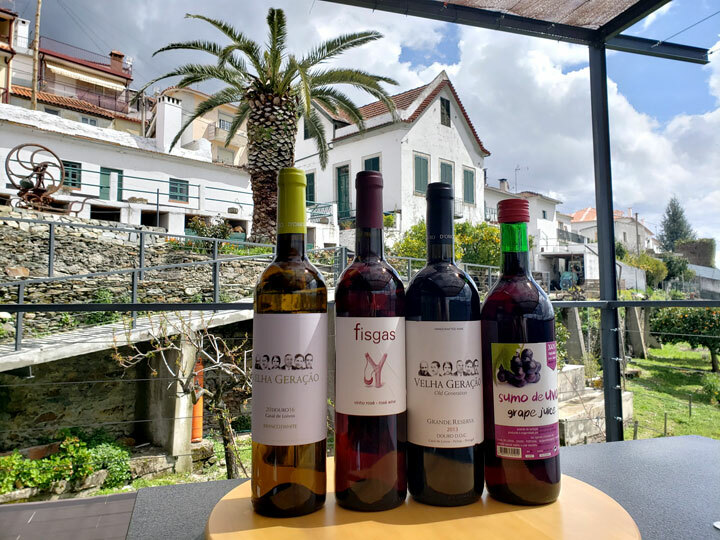 After Porto city, we were heading to our second trip’s destination – Douro valley, such a beautiful and magical place, paradise. We left Porto late in evening and the GPS gave us a wrong route to our quinta in the valley. Later we found out that we chose horse road so it was a bit challenging at this point, but when we reached our destination we were greeted by the charming villa’s atmosphere and people. We came when it was dark so we could not see the beauty of the valley, but when we woke up and saw that breath-taking landscapes we were honestly surprised. The quinta’s name – Quinta do Silval. They’ve got very hospitality staff who are really nice and accommodating, especially the manager – Eduardo. He called us before coming, suggested to prepare dinner for us because we were the only guests that night, greeted us, and on the next day he showed us around the property, gave us a tour about winemaking and told some interesting history. They produce their own wine and export same to Asia and the United States. 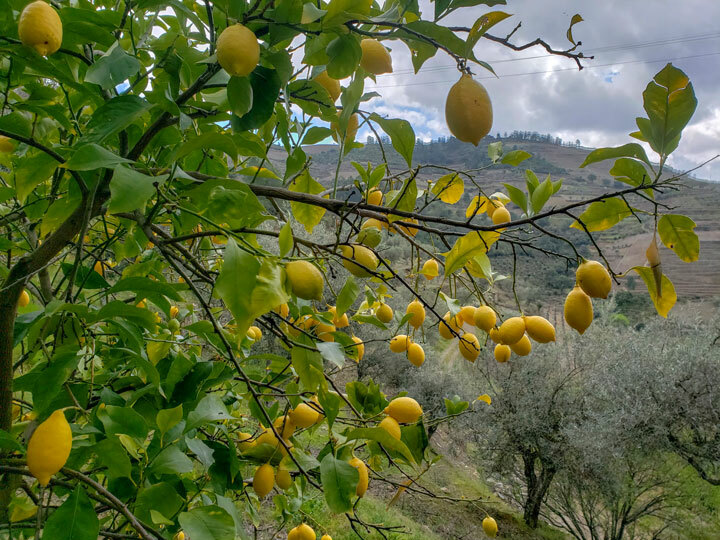 There are grapes, oranges, lemons, and olive trees around; such a quiet atmosphere, with nature all around. 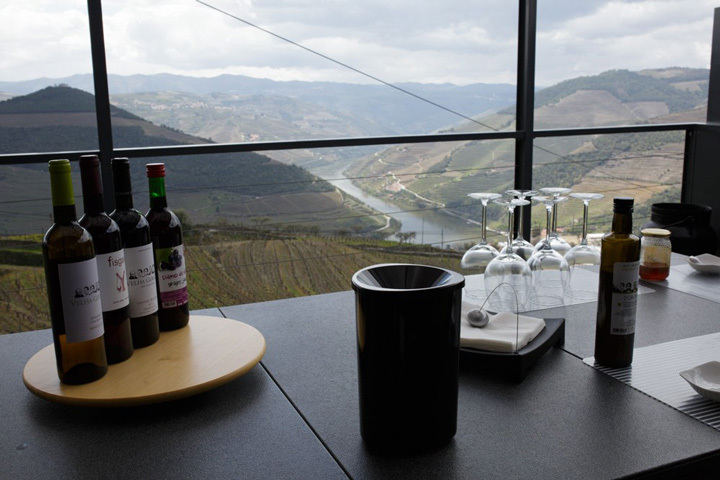 I would highly recommend you visit Douro valley. In Pinhao, not far away from the quinta, you can visit the olive oil museum. They make tastings of olive oil, hummus, bread, local honey, grape juice and wine for about €15 per person. For lunch or dinner, Veladouro is a must stop for everyone. Be sure you’ve emptied your stomach before coming because they’ve got very delicious food with huge portions. Your visit to Veladouro restaurant is definitely not complete without a plate of octopus! That’s where you’ll find the tastiest octopus ever, very juicy and big. You can try black pig, I don’t eat meat, but this black pig is something all meat lovers should try, it’s from the local farms. Also, we found and tried the best codfish in the whole of Portugal; they were not fried but nicely baked. Potatoes and big, fresh salads come with main dishes too, and that is really nice. I love good salads and this place is really top notch. It’s one stop you should go to eat over and over while you’re there. I still can feel the taste of the food. 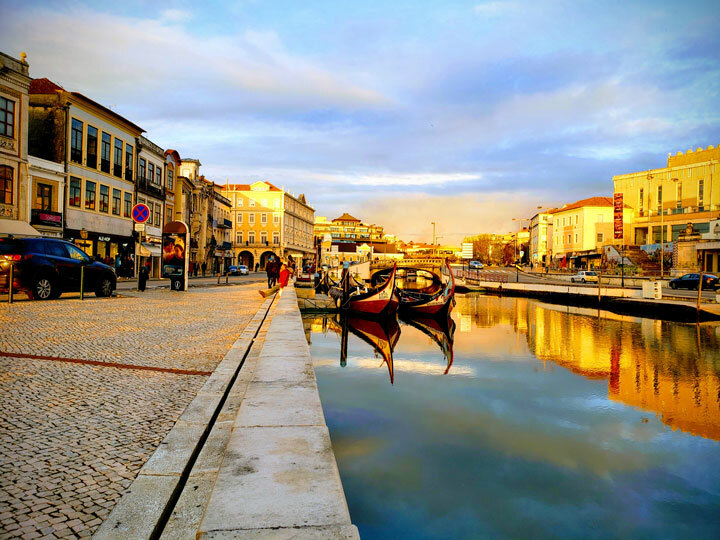 Our next stop was Aveiro, it is a small fishing town called Portugal’s Venice, famous for its canals, where colorful and traditional fishing boats sail along its waterways. It’s possible to make a short stop on the way to Nazare. In Aveiro, you must try their local pastry called Ovos Moles de Aveiro which is made from egg yolks and sugar. First time I tried a dessert like this, I cannot say I really liked it – one is okay but two is too much; you have to love eggs a lot to like this. If you expect to see colorful houses, then Costa Nova is your go to place, situated just 20 minutes away from Aveiro. However, we did not make it because it was getting dark when we finished our walk in Aveiro. Next, we went to Nazare, where we spent a night. 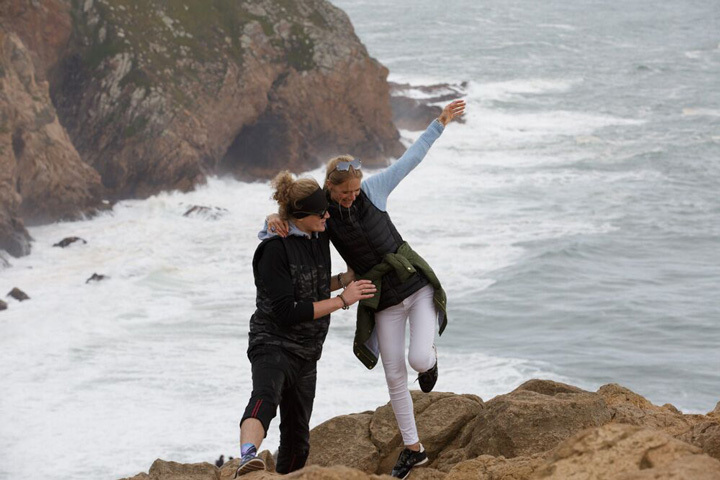 In Nazare, you will find the most peaceful beaches where you will see the biggest waves the country ever experiences and one of the biggest in the whole world. 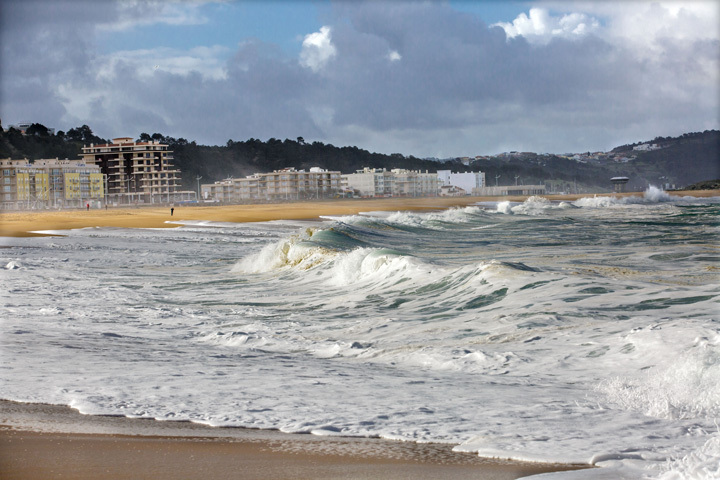 Nazare got giant waves, were all surfers go; waves can be as high as mountains. You can expect them highest on winter months, especially January and February. 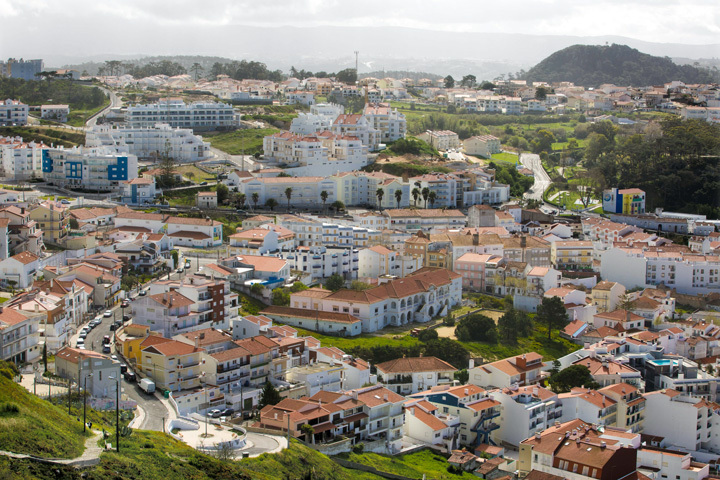 When you are in Nazare take a lift tram to the mountains and take a look at the coastline from this high point. On November 8, 2017 – Brazilian surfer Rodrigo Koxa broke Guinness world record for biggest wave ever surfed, reaching 80-foot (24.4 meters). Check videos on YouTube, it’s quote amazing like a scenery from a movie and it happened all here in Nazaré, Portugal. Lisbon was the next. 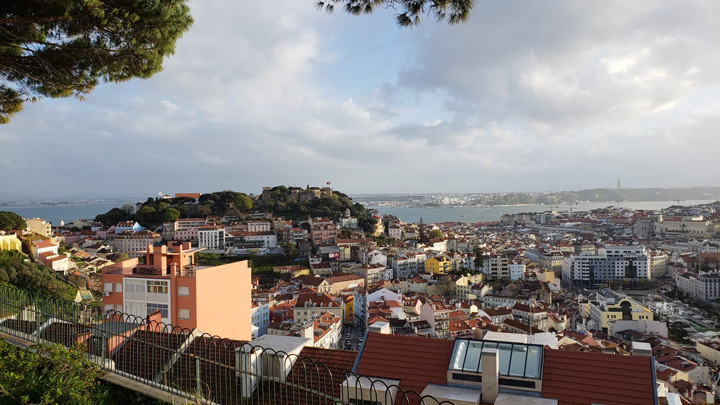 When you are in Lisbon, check the place called Miradouro da Senhora do Monte, it’s the highest hill and you’ll have the whole city at your feet. It’s not a touristic place, so you will enjoy every bit of it. Enjoy walking in Lisbon center, there are many shops and restaurants. 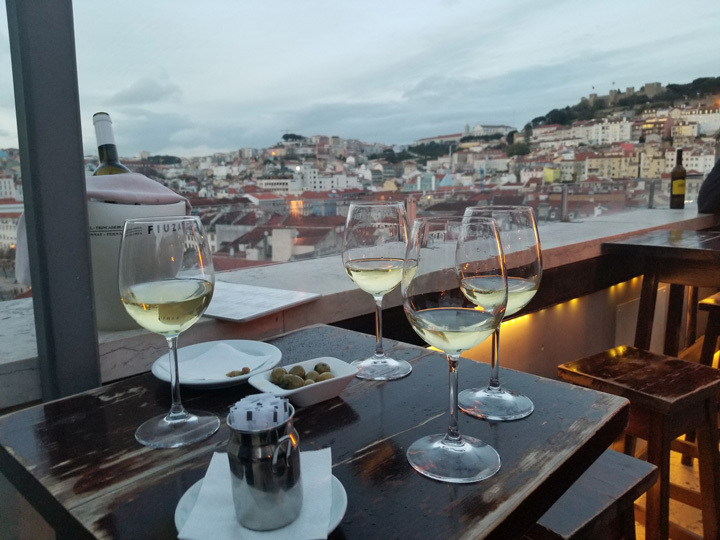 On your way to Santa Justa Lift I would highly recommend to stop by Bellalisa Elevador – Restaurante Panorâmico em Lisboa – such a charming view of Lisbon city. They have a really nice terrace and you can enjoy a cup of tea or a glass of wine or even get some delicious food. Another place with the nice view, especially for those who like to watch beautiful sunsets, you can stop by at Noobai café. 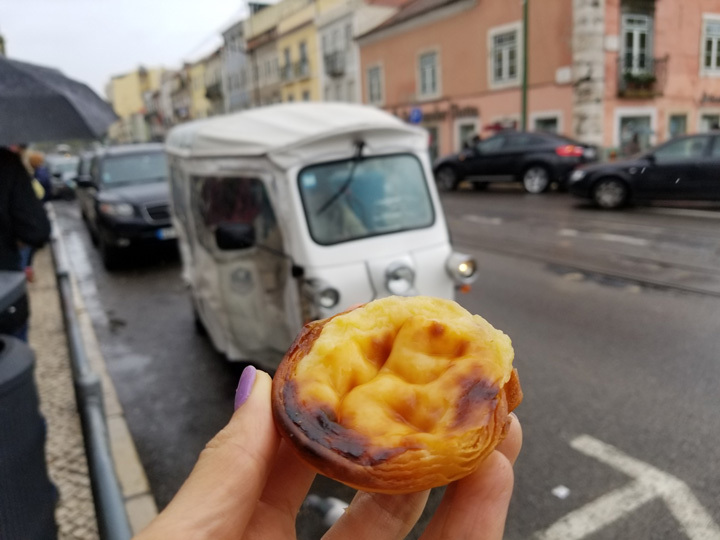 For the best custard tarts Pastel de Nata go to Pasteis de Belém. The Portuguese egg tart pastry has got an unbelievably delicious taste. They have been making them since 1837. It is the place where the first Pastel del Nata was born, so you can imagine how good they are. While you are there have a walk in Belém neighborhood, check Belém Tower. For Fado Show we went to O Faia. We got recommendation from the locals living in Lisbon, and for sure we got amazing fado show, such a good experience, singers had very good voices, everything was in Portuguese language and was so authentic. 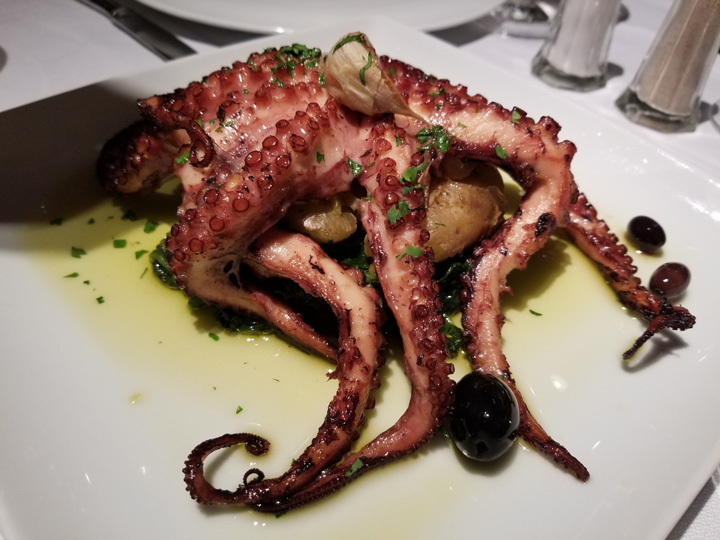 You can’t make videos or pictures over there, so just enjoy the dinner while watching one of its kind show, so unique and traditional of Portuguese culture. Pena Palace, one of its kind castle, so uniquely beautiful, that it’s a must visit place, no exceptions. Just recommendation would be to try to go early in the morning, when it is not so crowded and prepare to spend like half the day if you want to visit inside and make pictures from every corner of this castle. It is a very beautiful castle, and the most spectacular castle I have ever seen, very different, so colorful. Cabo de Roca is a must visit when you are in Sintra. It’s a cape which forms the westernmost extent of mainland Portugal, continental Europe and the Eurasian land mass. 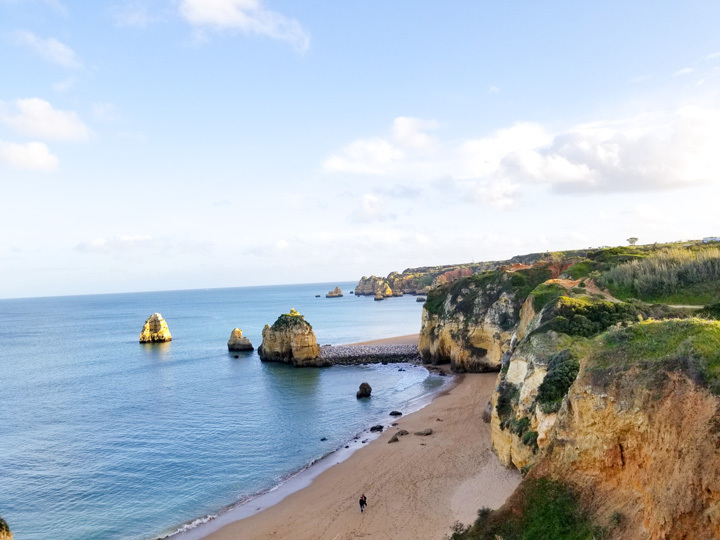 If you planning your trip to Portugal in warmer months, from late spring to early autumn be sure to visit this southern part of Portugal, called Algarve. 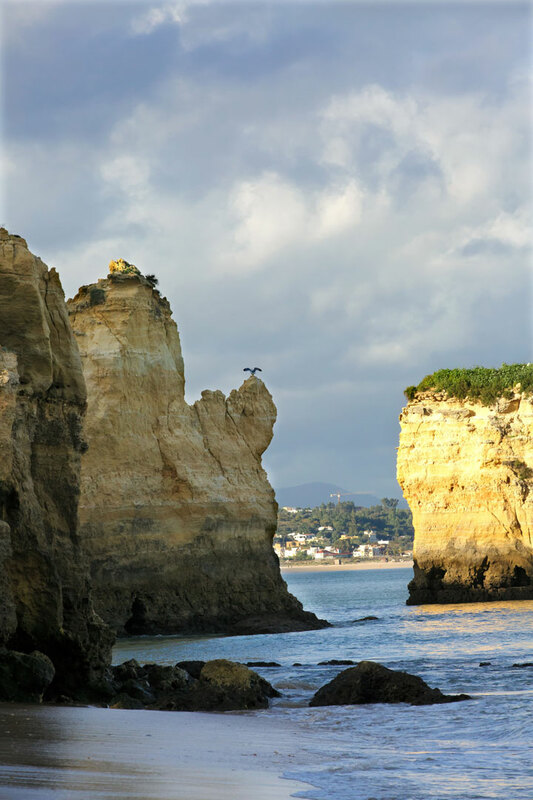 Thereafter you can take the road which goes along the Atlantic Ocean all the way to Lisbon. 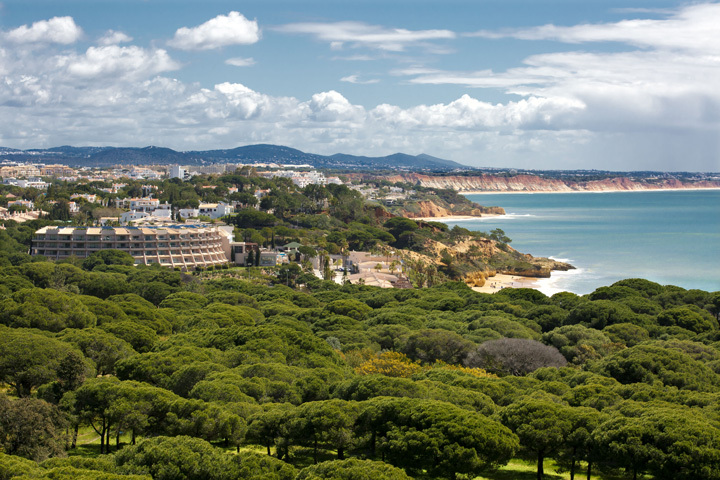 Albufeira is a coastal city in the southern Algarve region. It is a former fishing village that has become a major holiday destination, with sandy beaches and a busy nightlife strip; you can expect a lot of restaurants and souvenirs shops in Albufeira’s downtown. We spent only one night there. I am not a big fan of busy resort life. If you are a big lover of nature like me then you must check out Lagos. 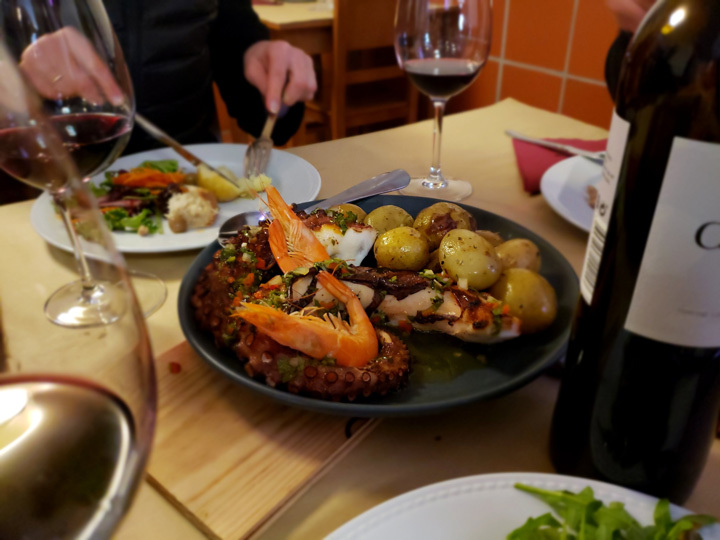 When you are in Algarve region you should try their dish called Caldeirada. It is an excellent fish with shellfish stew mix and a special recipe for all fish lovers. 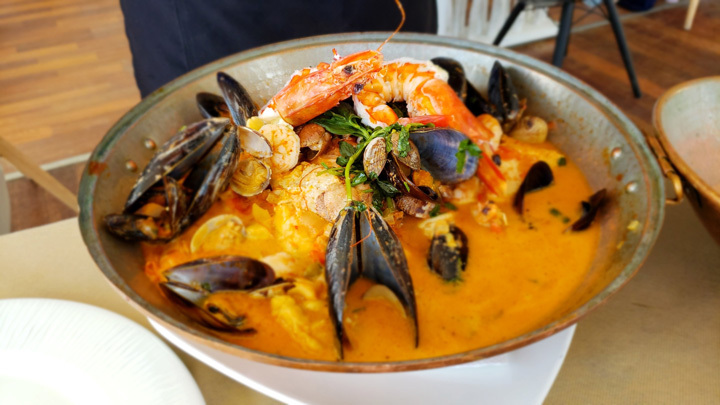 I don’t know about you but when I am in a new country I always want to try the local cuisine, that’s why I included some good restaurants and local dishes. It’s really hard to find a good restaurant when there are plenty of them in every corner and on the internet as well. In Portugal, they usually sell salt codfish cakes that are called Bolinhos de bacalhau (codfish, eggs, parlsey and onions) – Yummy :). You can order as an appetizer or just grab it in a pastry shop or fresh one bacalhau fresco serving boneless codfish over boiling potatoes. Sardines – they are commonly served in cans, but fresh sardines are often grilled, pickled, or smoked. Again, you should not forget to try octopus over there. Portuguese have really good cheese. We had an opportunity to try Azeitão which is DOP protected, handcrafted, unpasteurized sheep’s milk cheese made at the foothills of the Arrábida Mountains in the south west of Portugal. Azeitão is a cured cheese, of a buttery, pudding-like, semi-soft consistency; it goes really well with crackers. Most of the desserts are made from egg yolks and sugar. Pastel de nata is my favorite one. For souvenirs: Azulejo (ceramic tiles) you can find bracelets, hot pads for dishes, magnets, cork products including wallets and small bags. Rooster is an unofficial national symbol of Portugal so you can get them depicted in ceramic, postcard or dish towels. 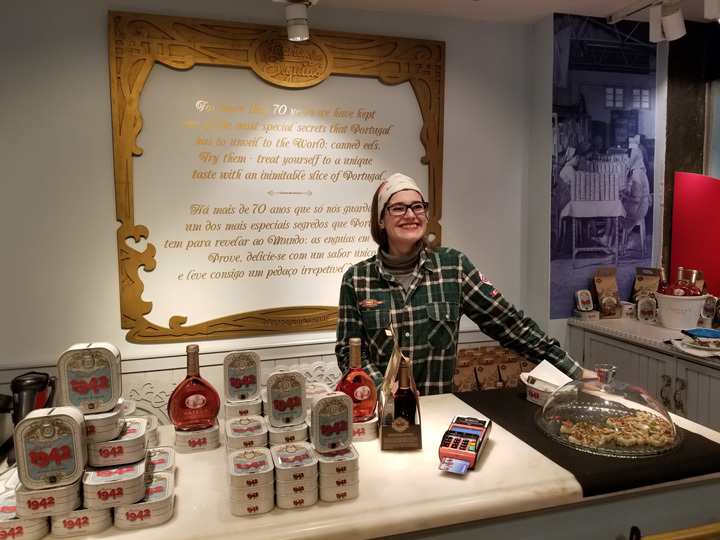 Canned fish – we saw some unique souvenir shops in Lisbon, selling just one type of item – canned fish – eel, sardines or others – you can try them before buying. Eel factory shop called Fabrica das Enguias’ Comur. That brought our tour to an end. We had our return flight from Lisbon. If you are going all the way to the south I would suggest you take a flight from Faro, this way, you don’t need to come back. We chose to start our trip from the north, but you can always choose start from the south to the north. I’m sure you enjoyed the reading and got some inspiration to explore Portugal any time soon. I’ve also left some vital tips to guide your choices so you don’t wind up making mistakes with your picks. 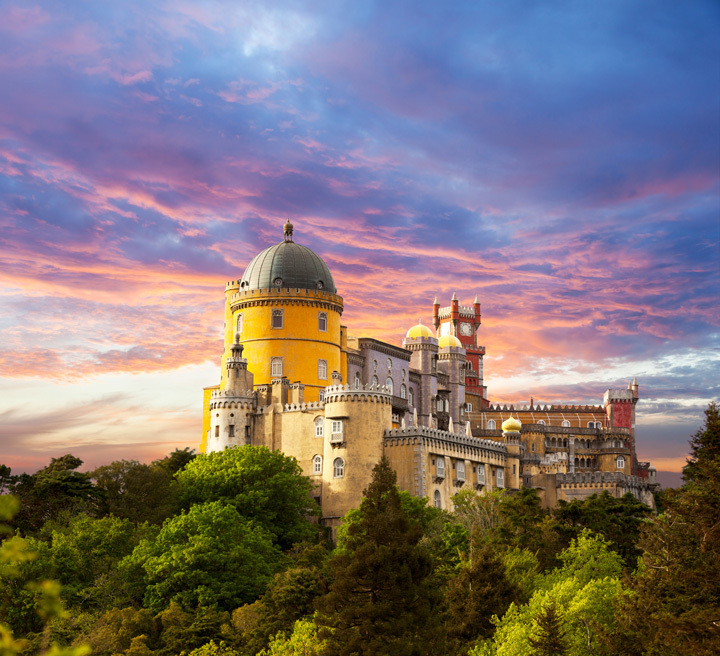 Without a flicker of doubt, Portugal is just one of those countries you just can’t wait to visit and revisit again. Hello enchanted Portugal; brace yourself, because we will be back! Very nice article. Loved that you made recomendations so it is easier for travelers to see and experience local life and culinary. Will definately visit Portugal . Thanks!! !